Walpeup Shire (1911-95), in the Mallee region of north-west Victoria, was proclaimed on 1 November 1911. It consisted of severances from Dimboola, Karkarooc, Lawloit, Lowan, Mildura and Swan Hill shires. The formation of the shire coincided with the growth of Ouyen and the development of Mallee farm holdings west of Ouyen. The area west of Ouyen was found to have soils similar to those successfully farmed around Pinnaroo, South Australia, and test bores confirmed the availability of acceptable water from the border to near Underbool. 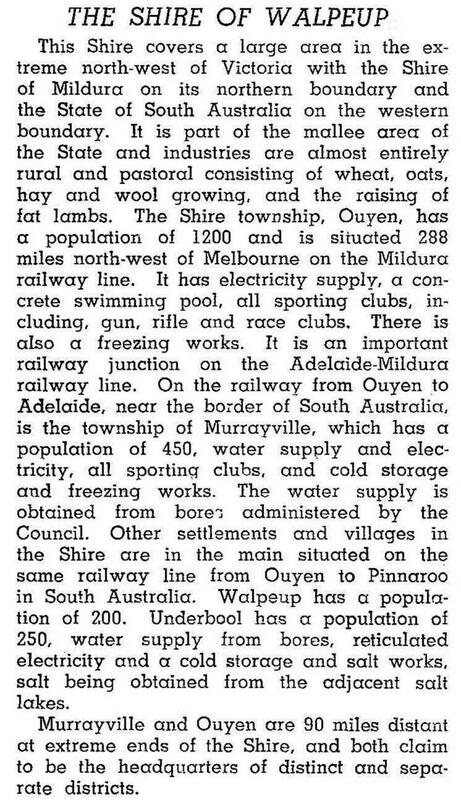 Farm selections were first offered in 1909 and the railway line from Ouyen to Murrayville was opened in 1912. The farmland along the railway line and the parallel Ouyen Highway is flanked north and south by the Murray-Sunset and the Big Desert National Parks. Walpeup shire is named after the Walpeup township which is 28 km west of Ouyen. It is thought that the name was derived from an Aboriginal word, perhaps meaning stumpy tailed lizard or an indigenous acacia. Walpeup shire was predominantly a sheep and wheat growing area. Apart from rainfall, water was obtained from wind pumps and the limits of the Waranga Western and Grampians channels. The channels extend as far as Underbool. When Walpeup shire was united with Mildura in 1995 it had an area of 12,180 sq km, the largest in Victoria. Over half the area was National Parks or reserves, and 5191 sq km was farmed. In 1994 there were 331,000 sheep and lambs, 7250 pigs and 7000 cattle, and the cereal harvests comprised 94,200 tonnes of barley and 135,240 tonnes of wheat. The population loss from 1933 to 1947 is mostly explained by the erosion and sand blow problems which occurred in the Mallee.